This is a 'must see' website. The famous collection of Luerzers archive is online. Every one who is doing advertising research should visit this website once in a while. Campaigns from countries throughout the world are dated, listed and shown in full color. There are also collections of pack-shots, commercials, posters etc. Here you will find many, very open, Diesel advertisements. This link will direct you to their ad example page. Very good quality. 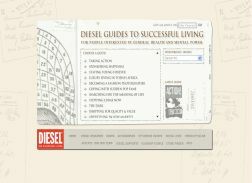 A site with more than 2300 examples of perfume ads and commercials, dated by year. Good quality. Another fine collection of ads and commercials. You can search through agency listings, portfolios, and individual ads -- by industry category, location, services offered, client and more. Commonly called "testimonials," or "celebrity endorsements," this technique of persuasion says that consumers relate to the person(s) appearing in the ad: if the celebrity/athlete/star uses the product, then it must be good, so I will purchase it too. You will also find some European examples. There are different ways to show your dissatisfaction with ads. A very striking and funny way is to alter some existing ads or creating new ads in order to ridicule the existing ads or the companies behind them. On this site you will find some of these so called 'spoof ads'. This site is devoted to some forms of advertising that are generally known as subliminal advertising. Though the site has a not so easy to understand structure, you will find a lot of examples and information. 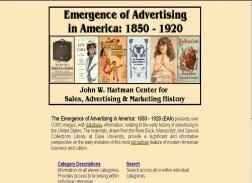 The Emergence of Advertising in America: 1850 - 1920 (EAA) presents over 9,000 images, with information, relating to the early history of advertising in the United States. The materials, drawn from the Rare Book, Manuscript, and Special Collections Library at Duke University, provide a significant and informative perspective on the early evolution of print ads. Another site where you can find examples of advertisements of different time periods, products, brands etc. Adflip has a searchable database of classic print ads where you can search by category, by decade, year etc. In 1999, Prof. Pollay donated approximately 8,000 slides containing tobacco advertisements, tobacco industry issue ads, and anti-smoking ads to Roswell Park Cancer Institute. Roswell Park engages in cancer prevention and tobacco control research, including research into the activities of the tobacco industry. 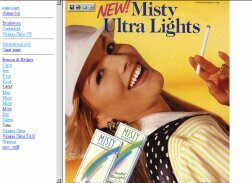 The Advertisements depicted on this website are intended for educational, academic, and non-commercial use only, and are not intended to promote the purchase or use of tobacco products! 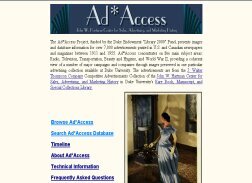 The Ad*Access Project presents images and database information for over 7,000 advertisements printed in U.S. and Canadian newspapers and magazines between 1911 and 1955. Ad*Access concentrates on five main subject areas: Radio, Television, Transportation, Beauty and Hygiene, and World War II. On this site you will find some perfume ads, with a semiotic description of them. The content is based on a written article and contains some color ads of perfume brands. It also provides some conclusions on the how and why women are portrayed in perfume ads. This is a large (unofficial) collection of Calvin Klein magazine ads on the web. Click on any description to see the ad itself. 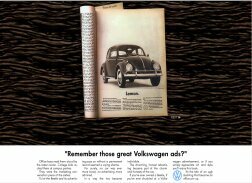 A few print ads and commercials of old but famous Volkswagen ads. 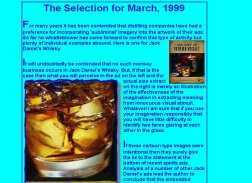 The site is advertising the book, but you will also find some well known ads (good quality) on this website. 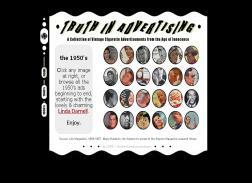 This is a collection of portrayals of women in cigarette advertising. Sadly in many of the ads only a part of the ad can be seen. Extensive collection of Absolute advertisements. 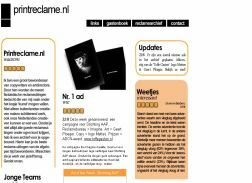 A Dutch website with mainly print ads for the Dutch market by young creatives. 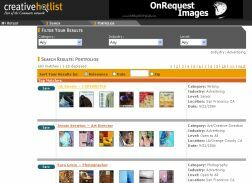 Creative Hotlist enables users to find resources for any aspect of the creative marketplace including artists and designers, Individuals can view portfoliosand search by keyword. This link will bring you to portfolios for the industry advertising. 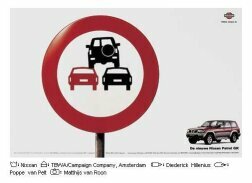 A historic view on Dutch advertsing. 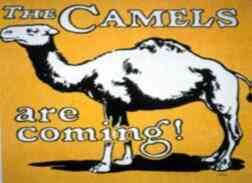 Ads produced between 1870 and 2000 can be seen online. International, homogeneous, and characterized by universal themes, Benetton Group's advertising campaigns have been, since 1984, not only a means of communication but an expression of our time. On Benetton's website you will find many examples of their ads as well as campaign information. 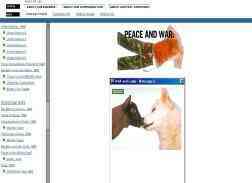 This link will direct you to their ad example page. A collection of cigarette advertisements from the 1940s and 1950s.